Histopathologic examination of melanocytic neoplasms can be challenging and subjective, with no specific circulating or tissue-based biomarkers currently available. Recently, a circulating 38- microRNA profile of melanoma (Mel38) was described. Aim: In this study, the expression of Mel38 in solid tissue is examined in the context of disease state, patient outcome and messenger-RNA regulation. 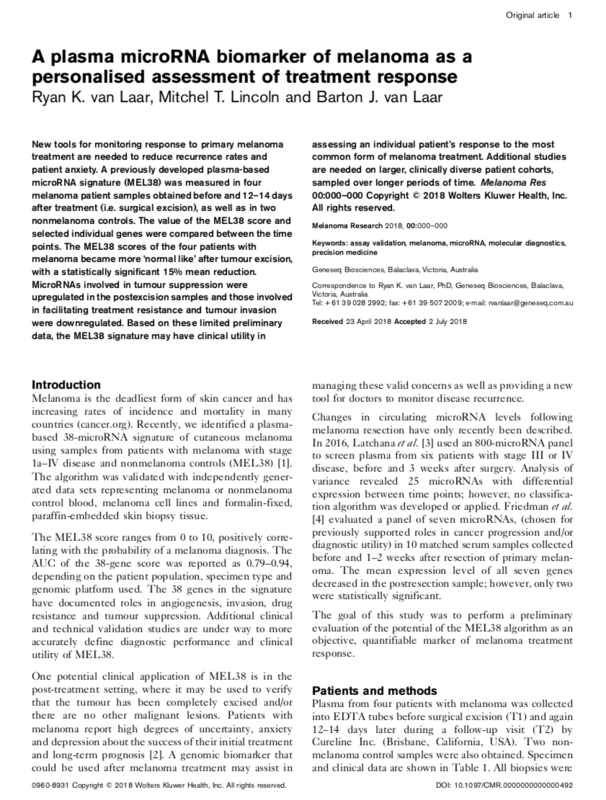 Methods: Mel38 was applied to newly-created and archival, clinically-annotated, solid-tissue genomic datasets representing benign naevi, primary and metastatic melanoma. Univariate and multivariate statistical analyses of the signature in relation to disease status, patient outcome and molecular pathways was performed. Results: Mel38 was able to stratify genomic data from solid tissue biopsies on the basis of disease state and identify patient subgroups with significant differences in melanoma-specific survival. The 278 experimentally-verified messenger-RNA targets of Mel38 also exhibit significant prognostic expression patterns. Pathway and functional analysis showed that Mel38 regulates a significant subset of the Melanoma KEGG pathway as well as key gene categories required for melanoma development and progression. Discussion: The Mel38 microRNA profile may have diagnostic and prognostic utility in solid tissue, as well as being a robust circulating biomarker of melanoma. Background: Histopathologic examination of melanocytic neoplasms can be challenging and subjective, with no specific circulating or tissue-based biomarkers currently available. Recently, a circulating 38-microRNA profile of melanoma (Mel38) was described. In this study, Mel38 expression and its impact on downstream mRNA regulation in solid tissue is examined. Methods: Mel38 was applied to archival, clinically-annotated, solid-tissue genomic datasets representing benign naevi, primary and metastatic melanoma. Statistical analysis of the signature in relation to disease status, patient outcome and molecular pathways was performed. Results: Mel38 is able to stratify genomic data from solid tissue biopsies on the basis of disease status and differences in melanoma-specific survival. Experimentally-verified messenger-RNA targets of Mel38 also exhibit prognostic expression patterns and represent key molecular pathways and events in melanoma development and progression. Conclusion: The Mel38 microRNA profile may have diagnostic and prognostic utility in solid tissue as well as being a robust circulating biomarker of melanoma. New tools for monitoring response to primary melanoma treatment are needed to reduce recurrence rates and patient anxiety. A previously developed plasma-based microRNA signature (MEL38) was measured in four melanoma patient samples obtained before and 12–14 days after treatment (i.e. surgical excision), as well as in two nonmelanoma controls. The value of the MEL38 score and selected individual genes were compared between the time points. The MEL38 scores of the four patients with melanoma became more ‘normal like’ after tumour excision, with a statistically significant 15% mean reduction. MicroRNAs involved in tumour suppression were upregulated in the postexcision samples and those involved in facilitating treatment resistance and tumour invasion were downregulated. Based on these limited preliminary data, the MEL38 signature may have clinical utility in assessing an individual patient’s response to the most common form of melanoma treatment. Additional studies are needed on larger, clinically diverse patient cohorts, sampled over longer periods of time. In Australia, more money is spent on skin cancer than any other malignancy. Despite this, the mortality rate of melanoma, the deadliest form, has steadily increased over the past 50 years. Diagnostic imprecision and a lack of complementary molecular biomarkers are partially responsible for this lack of progress. Whole-microRNAome profiling was performed on plasma samples from 32 patients with histologically confirmed melanoma and 16 normal controls. A classification algorithm was trained on these data and independently validated on multiple previously published microRNA data sets, representing (i) melanoma patient- and normal-blood, (ii) melanoma and nevi biopsy tissue, and (iii) cell lines and purified exosomes. 38 circulating microRNAs had biologically and statistically significant differences between melanoma and normal plasma samples (MEL38). A support vector machine algorithm, trained on these markers, showed strong independent classification accuracy (AUC 0.79–0.94). A majority of MEL38 genes have been previously associated with melanoma and are known regulators of angiogenesis, metastasis, tumour suppression, and treatment resistance. MEL38 exhibits disease state specificity and robustness to platform and specimen-type variation. It has potential to become an objective diagnostic biomarker and improve the precision and accuracy of melanoma detection and monitoring. Healthcare IT News Australia is the authoritative source on the people, policies and technologies driving next-generation healthcare, delivering editorial insights into a tech frontier that is revolutionising patient care. Geneseq Biosciences presented the following poster and presentation at the final meeting of the Melbourne Health Accelerator program in December 2017. Geneseq Biosciences will be presenting the results of their Melaseq development activities at the World Melanoma Congress, being held in Brisbane, Australia in October 2017.